Anna University will conduct examination twice a year. Anna University Students had appeared for the Examination. Many Candidates have attempted on the Semester Examination. Anna University gives a chance to clear their arrears. Anna University conducts the Examination for the Students who have attempted in the Examination. 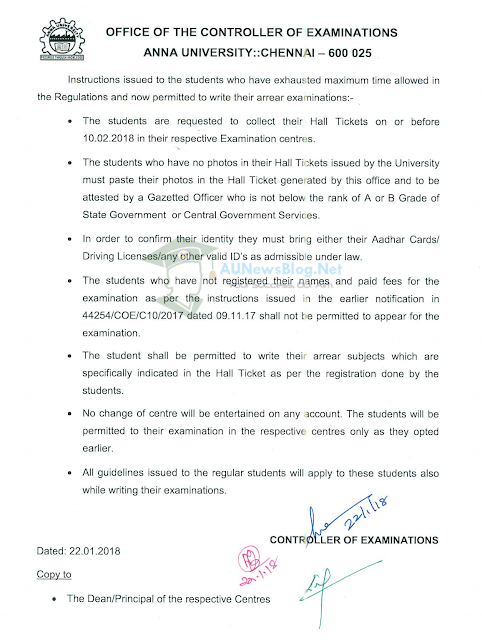 Students already paid for the arrear subjects, Download the Hall Ticket from the Official website. If the Candidates have no photos in the Hall Ticket provided, Paste your photos in the Hall Ticket by this office and attested by the Gazetted Officer(not below A or B). As a unitary type of University, Anna University was established on 04.09.1978. After that, This University has named as Dr.C.N. Annadurai. He is the former Chief Minister of the Tamil Nadu. Anna University offers higher education in Engineering, Technology, Architecture and Applied Science. Anna University is situated in the southern part of the Madras. Anna University provides UG(29) and PG(90) in various disciplines and In Affiliated University, UG(41) and PG(57).Anna university is the 201 place in the World University Ranking. Candidates must bring their Adhar Card / Driving License / Voter ID Card / Any other Valid ID for Identification. Who are not eligible to appear for the Examination? Candidates who have registered your name and applied for the Anna University Arrear Examination shall download the Hall Ticket on or before the 10.02.2018.